When discussing the Holocaust, some people ask, “Where was God?” Others ask, “Where was man?” Among other reasons, we study the Holocaust so that it won’t happen again. We grapple with the questions of what caused the Holocaust and who is responsible so that we can prevent such tragedies from recurring. We say evil triumphs when good men do nothing. This critical-thinking activity, meant to be completed at the end of a unit of study on the Holocaust, prompts students to determine whether or not the Holocaust happened because good men did nothing. 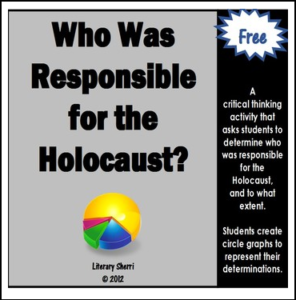 Students determine who was responsible for the Holocaust and to what extent they are guilty of crimes against humanity then create a circle graph (or pie chart) in which they assign the person(s) responsible the percentage of responsibility they should bear for the Holocaust. Although students do not have to use every category, all percentages must add up to 100%. The insights, sensitivity, compassion, and empathy students bring to your post-activity discussion will amaze you and make you feel secure in the capabilities of the next generation! I have used this activity with huge success with eighth graders following our unit on“The Diary of Anne Frank” and “Night” by Elie Wiesel. Reminders that their work will be posted and should reflect their personal pride and respect for the topic at hand have always resulted in a thoughtful, meaningful display. Be the first to know about store discounts, free products, and product launches! Just click the green “Follow Me” star under my store name on this page or click the red “Follow Me” star on Literary Sherri. Not a seller yet? Click here to sign up then leave me a note in my Q&A . . . I’m glad to help you with tips and strategies that will reduce the TpT learning curve and help you off to a great start!